1 of 2 Bring a large pot of salted water to a boil. Add pasta; cook 13 minutes or until tender. When there is 1 minute cook time remaining, add peas to pasta water. 2 of 2 Drain pasta mixture, setting aside 1 cup pasta water. 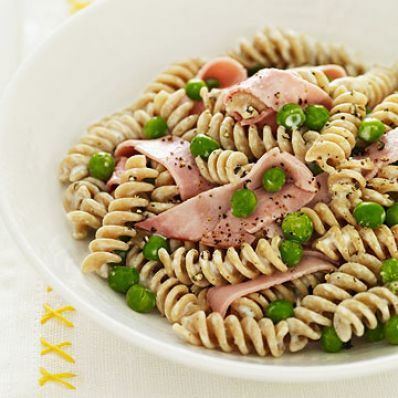 Return pasta and peas to pot and stir in cheeses and ham. Stir until well blended, adding pasta water by the tablespoonful if mixture appears dry.